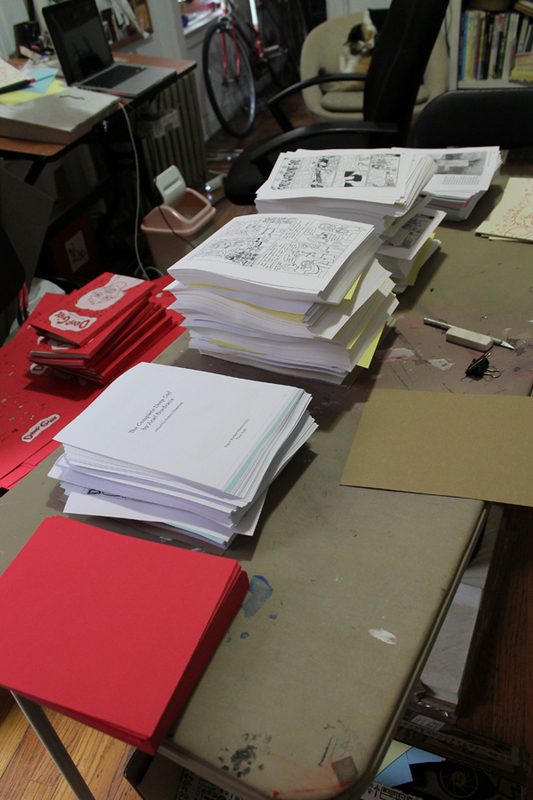 I spent all last week printing, binding, and shipping about 40 copies of The Complete Deep Girl. It’s slow going, especially the binding. There’s a learning curve, I’ve never bound a book like this before. The Complete Deep Girl is 128 pages, too large to be saddle stitched. 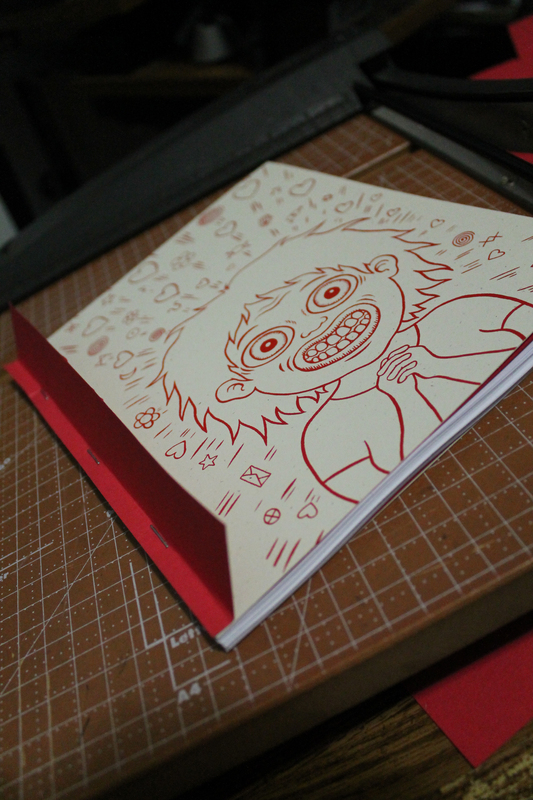 I had to create a faux square binding method using paper, heavy duty staples, and binding tape. I’ll walk you through the steps. 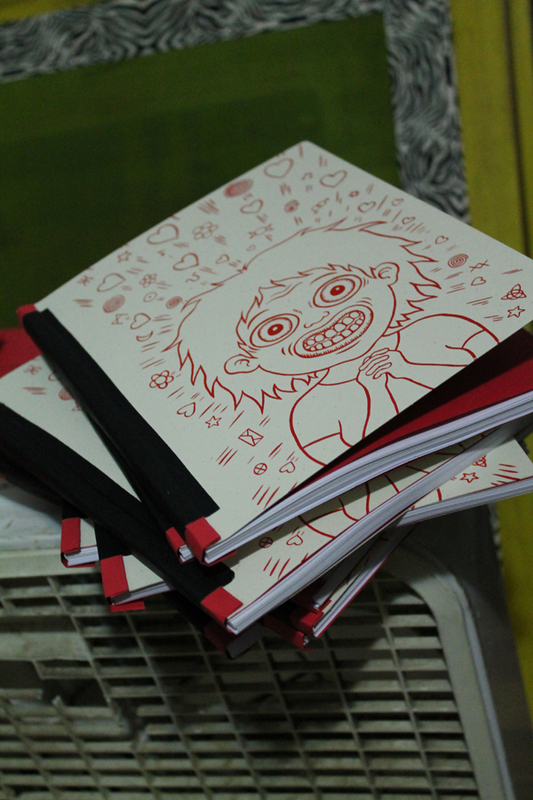 First, I have to collate the book. It has a small color section and a large black and white section. To keep the printing cheap, I had to split the book into two pdfs and have them printed separately. By the way, my printer for the last two years has been Best Value Copy. They are super cheap and the quality is quite good. They’ve never done me wrong. They don’t have a brick and mortar shop, you have to order online and receive your copies through the mail. Tell them I sent you, I think I get something! So, I ordered 70 copies of two printed files and they arrive by mail. I take that big heavy box to Kinkos, and pay them to use their fancy guillotine cutter to cut the whole thing in half. That leaves me with four stacks of pages to collate together (the first half of the color section, the first half of the black and white section, the second half of the black and white section, and the second half of the color section. 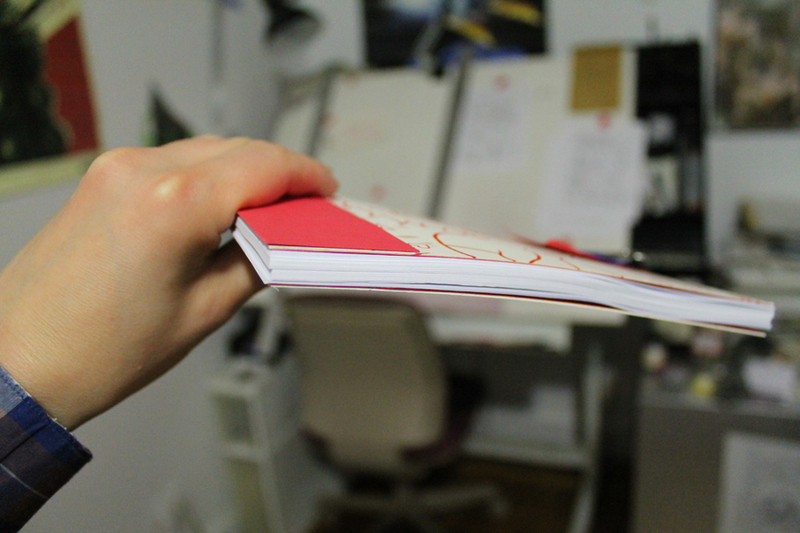 I colate the sections together, and sandwich them between two pieces of red paper (the end pages), the two pieces of the inner cover, and a red strip of paper (I need that for binding). I get the edges all nice and neat, then I hold it in place with a binder clip. Next, I staple the stack three times along the edge using a high capacity stapler. These staples are heavy duty, you need pliers to remove them. 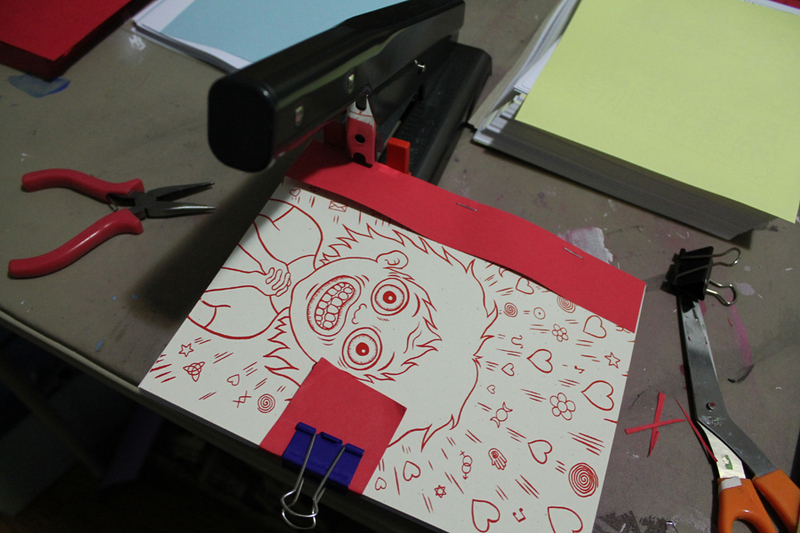 Then, I fold the paper flap back over the staples, and make the fold sharp with a bone folder. 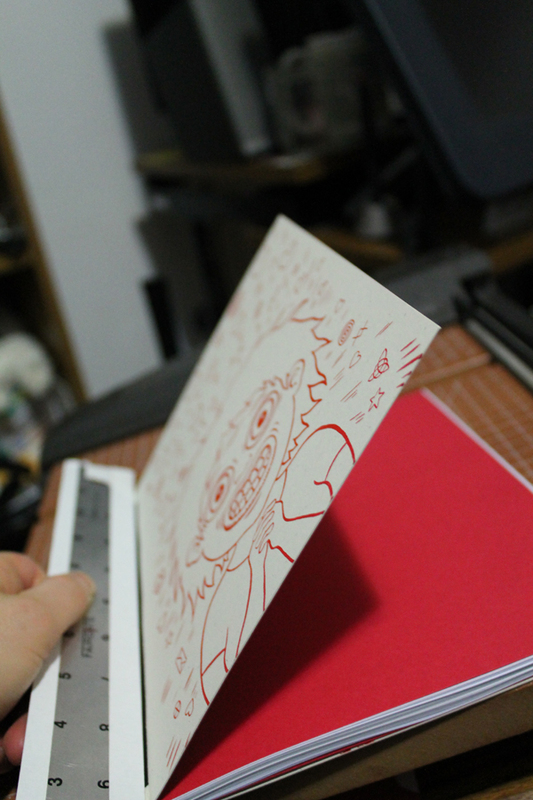 Then I fold the red paper over the spine and hold it in place with a piece of binding tape. 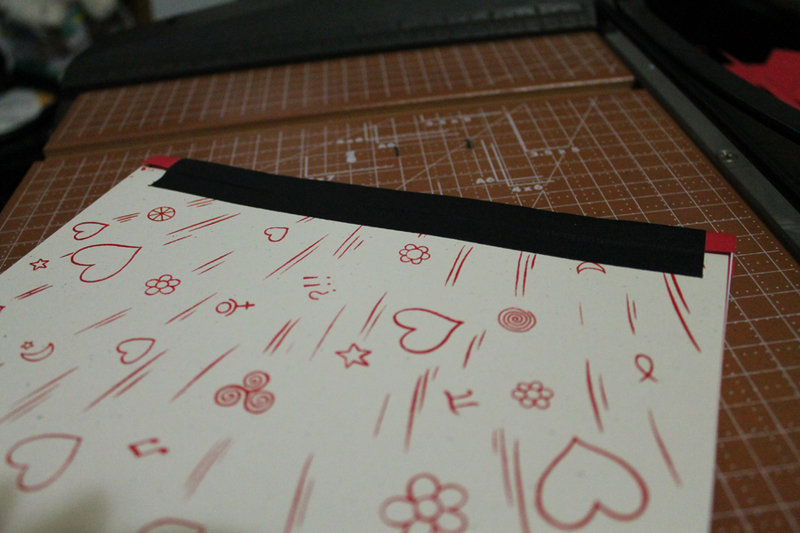 I have to fold the cover against a straight edge, giving it a score so the cover can be easily opened. So that’s it, the book is bound. I think it looks fairly classy. This approach is a little similar to “Sundays-Binding”. Check out their handy instructions!